Still plugging away although it doesn't seem like based on the lack of activity on this blog. 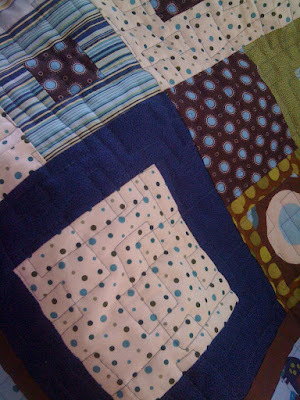 I've recently finished quilting another baby quilt - this one for a good friend who is due on March 15. The binding isn't on yet (nor made but that's just a minor detail) so this is just a sneak preview for you. Wait until you see the cut elephant backing! I'm not particularly fond of applique but the technique used for this is called "slaplique". You sew a straight stitch a half inch on the inside of your cut piece of fabric. It will fray once it's washed which hides any imperfections.